Read this excerpt from the brainy bunch, on sale now! Mona Lisa and Kip Harding are just your average high school sweethearts with ten children. Except seven of those ten children all went to college by the age of twelve (so far! ), and the youngest three are well on their way to joining them. The three oldest have gone on to become an engineer by 22, an architect with her own practice, and one of the youngest doctors in the Navy. The boys are currently studying to become a computer scientist, a musician/composer, and a scholar of the Middle Ages (who has the highest average in his college classes). The next one now in college (age 11) is already considering the field of law! Below is a small glimpse into the philosophy behind their unusual–and brilliant–practices. Everyone always asks “How did you do it?” Although we are so proud of our children, there is no science or formula to our success. We read that if you postpone formal learning until children are older, between about seven and nine, then they can cover grades one through eight in about a six-month period. That’s one way to do it. However, we start by age four and finish high school by twelve, eleven, or in Heath’s case, ten years and eleven months. At age four we teach letters, sounds, easy reader books, and tracing letters. We make it fun for the kids. We hear, “Look at me, I am so big!” Learning to read is the absolute most important first step. By age six we are teaching borrowing and multiplying, encouraging independent reading of easy books, giving a full page of dictation, and teaching Bible stories. By age eight the children are participating in projects. They start algebra and read real chapter books on historical figures and science books, and they do less dictation and more trying to write on their own. By age ten they are reading the Bible independently and figuring out what they really believe and why, finishing algebra, starting algebra 2 and geometry (figuring out math problems from the solutions manual), writing essays on real-world issues, and reading real books about history and science (we use some of the big siblings’ college textbooks if they are interesting). All along we try to find out what motivates the children individually and allow them to read and research whatever that may be. By age twelve they have finished lots of high school–level books on science, history, American government, economics, social subjects, and lots of math. If you throw in intense family discussions, experiments, group projects, lots of family/homeschool group field trips, some sports, church, socializing as a family with people of all ages and cultures, and love, you end up with a well adjusted kid who is ready for a college class or two. Want to read more? 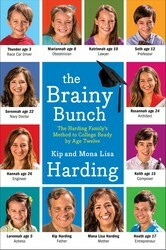 The Brainy Bunch is on sale now from Gallery Books! Having seven out of ten kids go to college is no small feat on its own, but having seven kids in college by the age of twelve? That's nothing short of incredible!